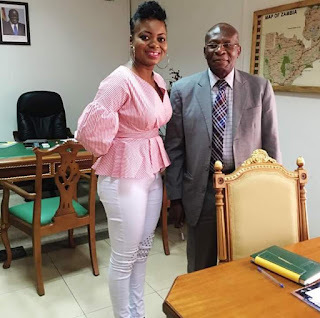 The next day after her safe arrival in Zambia, Ghanaian urban contemporary gospel artiste (Faffa) paid the Ghana High Commission unit a warm visit to have a face-close interaction with the unit's top excellencies and other diplomats. Her Excellency Margaret Ekua Prah, Ghanainan High Commissioner to Zambia, consular His Excellency Totimeh and a select few of Ghanaian diplomats gave Faffa a preferential welcome on her visit. They were really glad to meet their country's gospel songstress, concluding from their top-notch pleasantries and happy reactions. Faffa named her Zambian tour "Purpose Song Tour" after her latest release dubbed "Purpose Song".